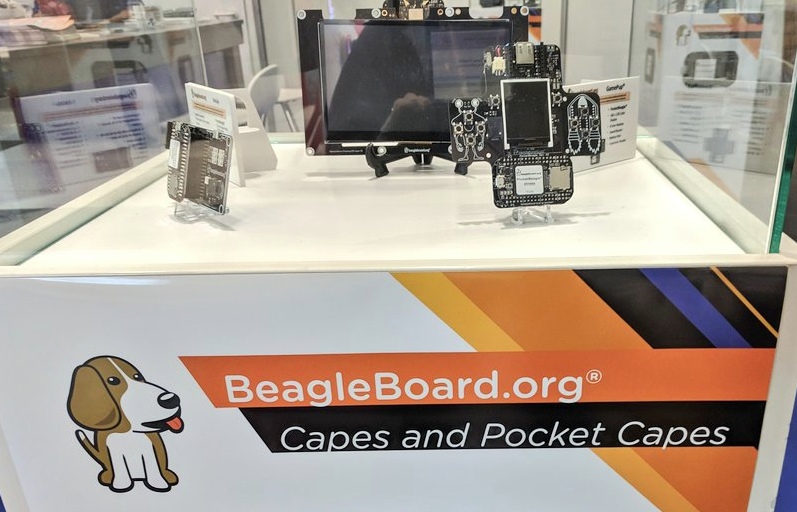 The leading international trade show and conference for embedded systems with over 32,000 visitors was the perfect place for the PocketBeagle® TechLab Cape and the PocketBeagle® GamePup Cape to make their debut. With plenty of IO and interesting features, these two additions to PocketBeagle® are a great way to have fun while learning embedded programming or to start a larger project. 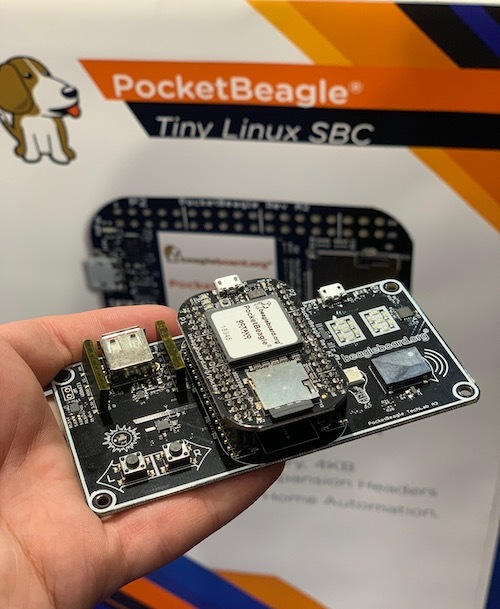 PocketBeagle® GamePup Cape is ideal for making a handheld arcade emulator, your own games or otherwise taking your PocketBeagle® on-the-go. With a 160×128 LCD display, USB host, I2C EEPROM, 10 user programmable buttons, LiPo battery port and buzzer, it has everything you need for gaming. The additional mikroBus header opens up a world of 600+ add on “clicks” for new sensors or outputs to your game. We can’t wait to see what you invent with your PocketBeagle® and GamePup Cape. PocketBeagle® TechLab Cape provides a great introduction to programming with Linux. Designed from ten years of lessons-learned from the BeagleBoard.org® community in teaching hundreds of individuals getting their first introduction to programming, TechLab engages beginners or those ready to hack the kernel itself. Each feature leads the way to learning a specific part of the AM335x Cortex-A8 inside of PocketBeagle, teaching skills helpful for more advanced projects. Accelerometer (via I2C), Tri-color LED (via PWM), 2-digit 7-secgment display (via SPI), Light sensor (via ADC) 2 push buttons (via GPIO), USB-to-serial and USB host are all easily accessible. With the mikroBus header on board, over 600 add on “clicks” are available for extending your TechLab with additional sensors and output modules. Easily add a WiFi dongle to instantly turn your device into an Internet of Things invention. Paired with PocketBeagle, the TechLab makes an ideal teaching tool for classroom use in a semester course or lab shortcourse. Get started right away with the Workshop Materials with special SD card image to download and walk through many of the board features with existing code examples. Each exercise has additional challenges to teach intermediate and advanced coding skills. Register for our mailing list for information on upcoming conferences, workshops and trainings using the PocketBeagle® TechLab.